I'll be the first to admit that I know very little about Minnesota. I know it's cold, I know Kirby Puckett and Prince live there, and I know that Marbury played the best basketball of his life wearing a Timberwolves jersey. As for hip hop, though? I don't think I've ever heard of any MCs repping for the North Star state. So when my man Marc from KissMyAssPlz hit me up with The Letter, a mixtape/album from a rapper named Mally out of Minneapolis (aka the 612), I was curious to hear what kind of style he was coming with on the mic. Citing Posta Boy and Jadakiss as his inspirations for rhyming, it's probably not all that surprising that Mally's lyrical stylings sound very "East Coast." Rapping over a nice selection of beats - including several from J Dilla - Mally spits rhymes about the current state of rap, his various hookups and his life in general, all with a swagger behind his words that I don't hear too often from unsigned rappers. He drops a few lines about women and white folks that are, for lack of a better word, gratuitous - not really offensive, just enough to occasionally distract from the rest of his lyrics. If you can overlook that, though, you'll find a really nice MC. As I said a couple of days ago, the underground is killing it right now, and Mally is further proof of that. If this is what Minnesota hip hop sounds like, I'll definitely be checking for more from up north. 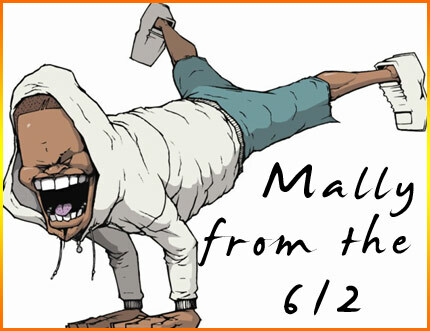 You can hear more songs from Mally's The Letter on his MySpace page and over at his website. And big shouts to Marc. He's got the bootleg mp3 game on lock right now (not that I condone that sort of thing, of course), so go show his site some love.